As you can see, over the summer we’ve updated the look and feel of the Museum of Fezology. We hope you enjoy it and find it easier to navigate and use! During the update, we also added several new displays to the collection. First up, we have five new fezzes in the Grotto and Related area, including an older Grotto fez and a complete set of Daughters of Mokanna fezzes, including a Past Supreme Mighty Chosen One fez, generously donated by the Supreme Caldron of the organization. We’ve added another piece to the Occupational Groups exhibit, with a Pennslvania Shield and Square Club fez, used by law enforcement and protective services members that were also Freemasons. 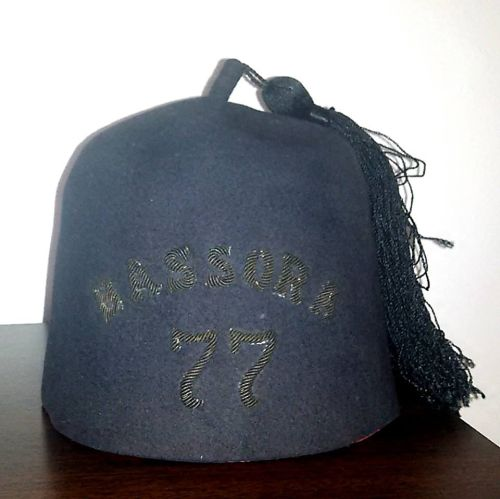 Another fez was added to the Sciots exhibit, hailing from New Jersey Pyramid No. 1. During the summer, the Curator the Museum became a member of New Jersey Pyramid No. 3, but was given a No. 1 fez, as no No. 3 fezzes were available in his size. Another example of a Past High Priestess’s fez was added to the Shrine Ladies area, coming from Neptune Court in New Jersey. Lastly, we have a brand new exhibit dedicated to the Princes of Bagdad, a side body to the Ancient and Illustrious Order of the Knights of Malta. We have a couple of fezzes on their weay to the museum now, so we hope to update again in the very near future. santhony	2016-10-17T18:38:02+00:00	October 25th, 2015|Updates|Comments Off on Updates Galore!